It’s One Room Challenge time! If you’re unfamiliar with the ORC, it’s a bi-annual design event hosted by Linda from Calling It Home. Basically you have six weeks to completely makeover one room in your house. 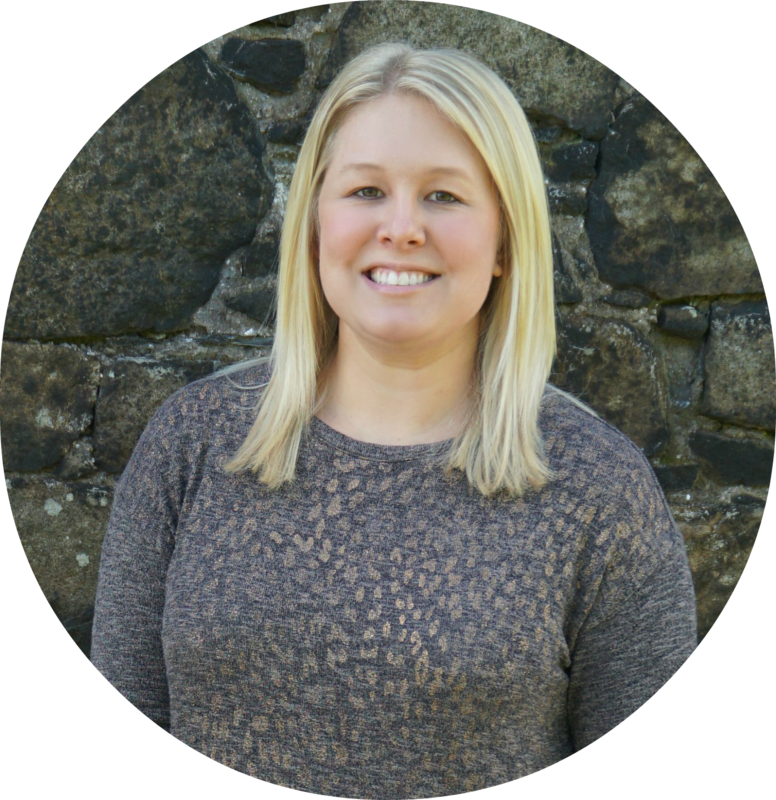 On Wednesdays the featured designers share their progress and the guest participants post on Thursdays. Anyone is welcome to join the challenge and link up with the other guest participants each week. I’ve participated a handful of times in the past. Last year I started on our garage, but shipping delays ruined my schedule and I wasn’t able to finish in time. Two years ago I worked on our master bedroom and I’m still obsessed with the navy walls. 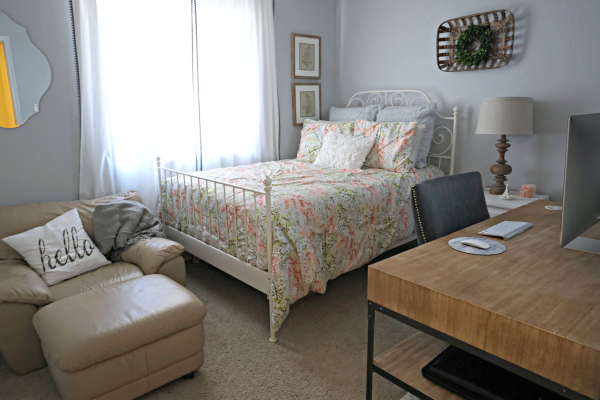 In 2015, I re-decorated our dining room for the spring challenge and the guest bedroom in the fall (yes, the same guest bedroom I’m talking about today). And then way back in 2014 I worked on the laundry room and master bathroom. So as you just read, I already finished this room a few years ago. It’s beautiful and I love it, but it’s just not working for us or our guests. We need a bigger bed in that room. Right now it just has a full size bed and that doesn’t sleep two people comfortably. Yes, two people can fit on the bed, but a queen is just such a better option. It also means that we can get rid of the pull out couch in the other spare bedroom and have more space for our gym equipment. It really is the best solution for the entire house. As you can see, we also added a desk in there since the original makeover. We decided to use the other spare room as a gym, so our office furniture got moved to this room. Everything fit, but it was pretty cramped. I ended up cleaning out the little craft room off our pantry a couple months ago and we now use that as an office. So the desk can go, which leaves plenty of room for a new, bigger bed. OK, let’s talk design plan. Below is the mood board I put together for the room. Sources are listed at the bottom of the post, but half of them are just for reference and not the actual product I’ll end up purchasing. 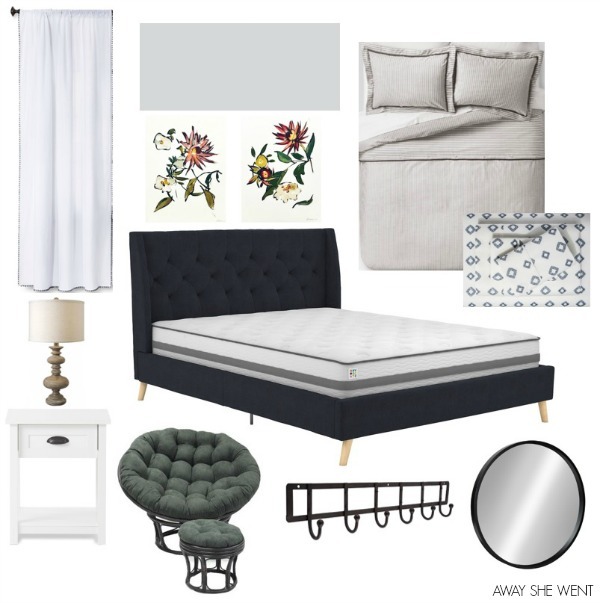 The bed is the Novogratz Her Majesty Upholstered Platform Bed. It’s available on various sites, but right now Amazon has the lowest price. Originally I wanted the bed in gray, but it sold out the day before I went to buy it. I ended up changing to the dark blue version instead and I think it’ll work out even better. I’ve already purchased it and it should arrive late next week. I’m hoping that the bed will look good with the current wall color so I don’t have to re-paint. The color is December Sky by Dunn-Edwards and I still really like it. This is where buying the blue bed instead of gray worked in my favor. I definitely would have had to re-paint if I had purchased the gray bed. The bedding is from Target and I’ve already ordered the sheets and striped duvet cover. I wasn’t sure if the light blue or gray striped duvet cover would look better so I ordered both while they are on sale. I’ll just return whatever doesn’t work. I still need to figure out the throw pillow situation. 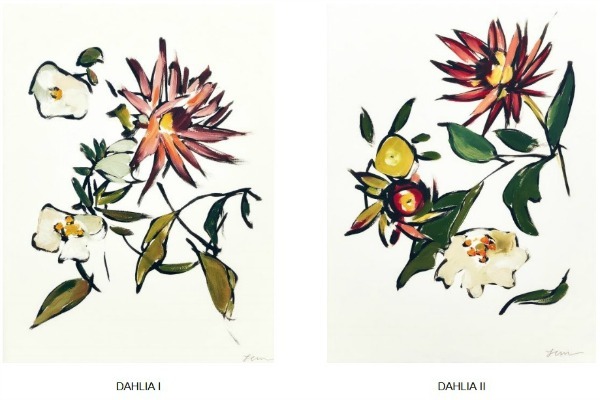 For the walls I’m planning to order these Dahlias I and II prints from Jenny’s Print Shop. Once the bed arrives I can measure out the best size to print and hang them. I’m also going to replace the current mirror with a dark-framed round mirrior. I still need art for another wall, but I’m not sure exactly what I’m going to hang yet. If you have any other suggestions about what will go with those Dahlia prints, let me know! I already have the lamps from the prior room design and I’m hoping they’ll still work in here. I’m not going to pick out nightstand until the bed is set up so I can easily measure the height. I’m thinking something white though. I’m also hoping I can use the same curtains and just replace the rod with a black one. I also need to find an accent chair for the room. The chair in there right now is the only piece of furniture that Adam kept and brought with him when he moved in. It’s not the best looking chair, but it is ridiculously comfortable. We’ll see how this chair thing works out. I think I can sell him on the idea of switching it with a papasan chair (he always checks them out at World Market), but I’m not sure if we’ll have enough room for one. A more sleek looking leather chair would look great too, but it’ll be hard to find one that not $$$. We both like to lounge in here and read occasionally, so I'm definitely leaning towards whatever will be most comfortable. I still need to figure out accessories and finishing touches, but that’s my overall plan for the room. Next week I’ll share my full to-do list and hopefully the bed will be delivered by then so I have some progress to share! 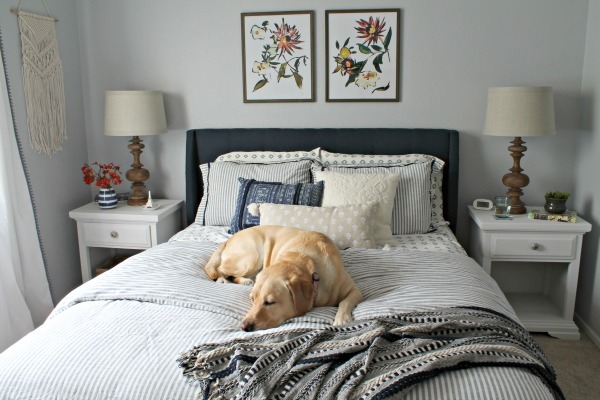 Don’t forget to check out the One Room Challenge featured designers here and the rest of the guest participants’ rooms here. There’s some serious talent in both groups and I’m so excited to see how all of the room progress over the new few weeks! *This post contains may affiliate links. I receive a small percentage of the purchase price at no additional cost to you. 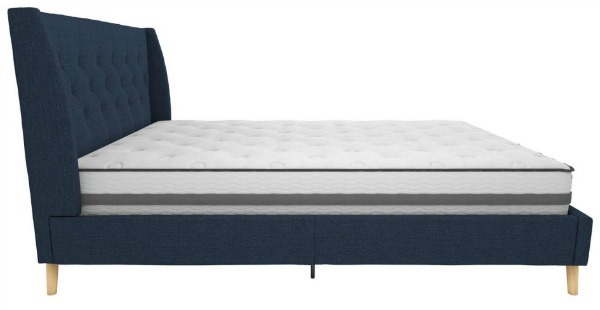 I have the Novogratz bed in both colors and I love them. The Navy is my favorite. I'm looking forward to following along! I'm so excited to hear that you have that bed and love it! It was delivered last night, but we still have to clear out the room before I can open it up. I can't wait! Yes, a queen is better for two people! What you've got planned looks lovely! And I didn't know the Novogratz had items on Amazon. That bed is gorgeous and has me thinking I need a new bed. It's like a perfect mix of modern and vintage! I didn't know that they had items on Amazon either until I started searching for beds! It has great reviews, so I'm excited to set it up and see it in person. Thanks Laura! The bed was delivered late last week and I'm so eager to put it together to see how it looks in person! Thanks! My mom is coming to visit next week, so I think she'll be the first one to officially sleep in there...although it won't be completely done by then. Yes! I would never exercise in there if we didn't have a TV! What a great challenge. I love the bed. I agree, I think that it will really bring a pop to the room! Thanks! I'm so excited to get it set up to see how it looks in person! A queen bed is definitely more comfortable than a full. All that you have selected looks fabulous! I need a challenge to get me motivated to redesign/redecorate some rooms in our house. This challenge always ends up being the push that I need to get a room started/finished! What a fun idea! 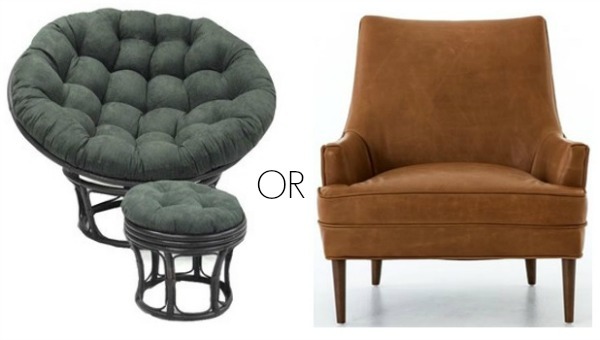 I love that leather chair, but you're right...finding an affordable one will be tricky. I love that chair so much, but it's way out of my price range ($1000)! Hopefully I can find something more affordable that'll work in its place. I agree on the bed! We went to pick out mattresses last night and found a really comfortable one!